For lovers of Sherlock, Shardlake and Ripper Street. 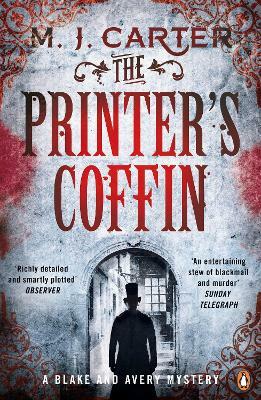 A hugely enjoyable action-packed Victorian thriller with a great detective double act. Published in hardback as The Infidel Stain. London, 1841. Mr Jeremiah Blake and Captain William Avery, recently returned from India, are invited by Viscount Allington to examine the particulars of a grisly pair of murders. Two printers from the seditious gutter presses have been brutally dispatched in distinct but similar circumstances. Fearing the deaths will stoke the fires of Chartism sweeping the capital, Allington hopes Blake and Avery's determination to uncover the truth will solve these crimes and help restore civic order. But there are others who seem equally determined that the pair shall fail . . .
M. J. Carter is a former journalist and the author of the Blake and Avery series: The Strangler Vine, The Printer's Coffin (formerly published as The Infidel Stain) and The Devil's Feast, and two acclaimed works of non-fiction: Anthony Blunt: His Lives and The Three Emperors: Three Cousins, Three Empires and the Road to World War One. M. J. Carter is married with two sons and lives in London.